Your menisci are two crescent-shaped pads of thick, rubbery shock-absorbing cartilage in your knee joint. They lie between your thigh bone (femur) and your shin bone (tibia). You have one on each side of your knee – the medial meniscus on the inside and the lateral meniscus on the outside. Your menisci act like shock absorbers, absorbing the impact of your upper leg on your lower leg. They also help to stabilise your knee joint and keep the movements of your knee smooth. Tears of the menisci are a common injury. They often happen when you play sports, but they can also happen as a result of age-related wear and tear as you get older. When people talk about a ‘torn cartilage’ in their knee they usually mean a meniscus injury. If you have a severe injury, it’s possible you might damage other parts of your knee as well as your meniscus. For instance, you might sprain or tear a ligament in your knee. You might feel a ‘pop’ if you tear your meniscus. Many people find they can still walk on their injured knee. However, it might become gradually stiffer and more swollen over the next day or so. Common symptoms include the following. Pain in your knee, although this can vary. Some people only have mild pain, and for others, the pain may come and go. Swelling, usually several hours after the injury. Feeling as though your knee is catching or locking, usually when your knee is bent. You may notice it making clicking or popping sounds too. Your knee feeling ‘loose’, as though it’s going to give way. Being unable to bend and extend your knee fully. Your knee may feel tender along the line of the joint. In younger people, tears of your menisci are usually caused by twisting your knee. This often happens when playing sport, for instance football or basketball. In older people, the menisci can become worn down and tears can result from more minor injuries, such as twisting awkwardly when you stand up. These are called degenerative tears. Most meniscal tears that cause symptoms don’t heal by themselves and will need some form of treatment. You’ll usually need to go to A&E with this kind of injury. 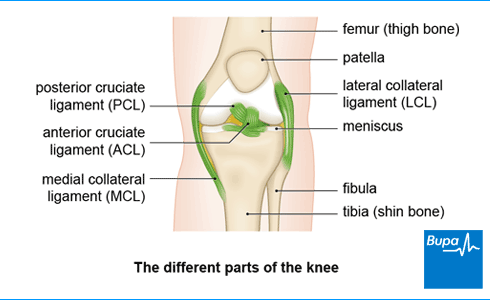 You may then be referred to an acute knee clinic, which will organise any investigations and treatment you need. What treatment you’re offered will depend on exactly where the tear is, how big it is, how severe your injury is and your age. The initial treatment will be to control your pain and swelling using the PRICE and HARM self help measures. Details of these can be found on the next tab. Further treatments include physiotherapy, medicines and surgery. You may see a physiotherapist or an orthopaedic surgeon for treatment. A physiotherapist is a health professional who specialises in maintaining and improving movement and function. An orthopaedic surgeon is a doctor who specialises in bone surgery. There are certain measures you can take, represented by the word PRICE, that will help to reduce your pain and swelling, and protect your knee. PRICE stands for Protection, Rest, Ice, Compression and Elevation. See infographic above for more information. There are also certain things that you should try to avoid in the first three days after your injury so you don’t cause further damage. These can be remembered as HARM, which stands for Heat, Alcohol, Running and Massage. Making sure you follow any physiotherapy and rehabilitation programme you’re given will be an important part of your recovery. The aim of physiotherapy is to help your knee recover its full range of movement, as well as its strength and stability. Your physiotherapist will carefully assess your knee and they will then plan an individual programme of rehabilitation exercises. These will help strengthen your knee and leg muscles gradually. You can take over-the-counter painkillers, such as paracetamol or ibuprofen, to help with any pain. Your doctor may prescribe stronger painkillers if your pain is severe. Always read the patient information that comes with your medicine, and if you have questions, ask your pharmacist or GP for advice. If you have a large tear, or physiotherapy on its own hasn’t helped, you may need surgery to repair it. You should also be referred for physiotherapy afterwards to restore your knee’s normal function. Surgery may involve either repairing your torn meniscus, or in some cases, removing the damaged part of your meniscus. Surgery is usually carried out during a knee arthroscopy. This involves using a very fine telescope (the arthroscope) and tiny surgical instruments inserted through small cuts in your knee, to perform the procedure.